Spring is the time for fresh blooms, new life + new growth. Buds are forming. Plants are sprouting. Fresh life is being created all around us. Spring is the perfect time to enjoy more plant-based meal options. 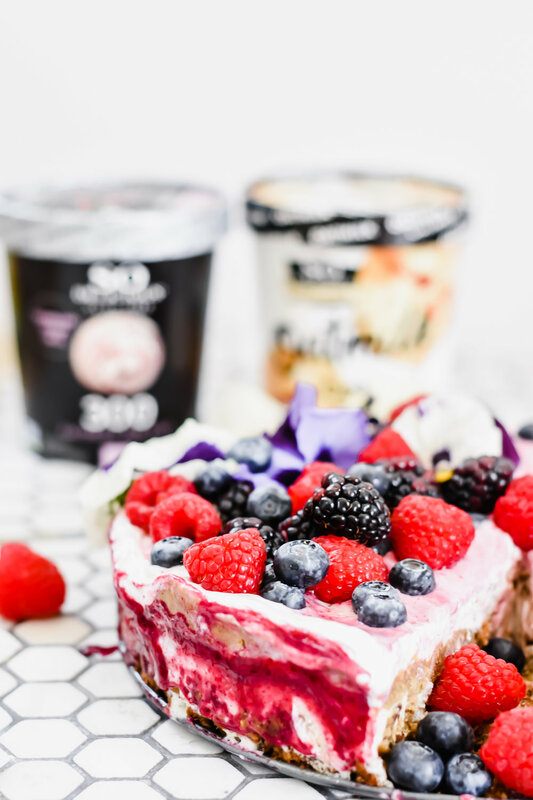 What better way to enjoy spring than with a Plant-based Ice Cream Pie with So Delicious® Dairy Free? So Delicious® frozen dessert brings this pie to life. It’s full of plants + completely decadent. 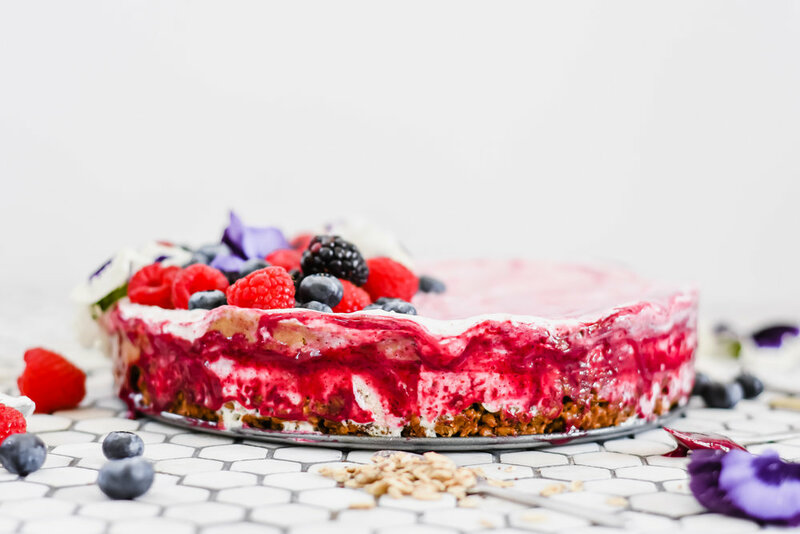 The creaminess of the pie is refreshing; the sunflower butter lends a hearty feel, the granola crust offers a crunch + the fresh berries lend themselves to a spring celebration. 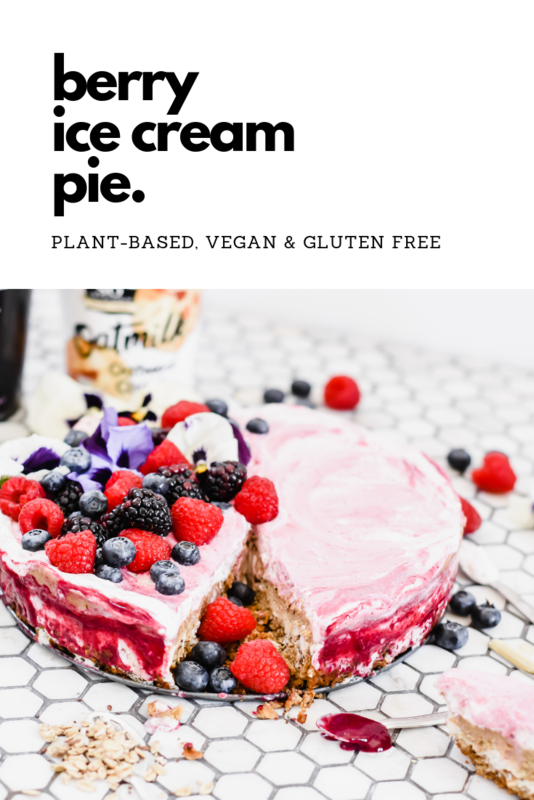 This recipe is plant-based, vegan, gluten free, dairy free, peanut + tree nut free, as well as free from the top 8 allergens. This recipe calls for no artificial colors or ingredients. 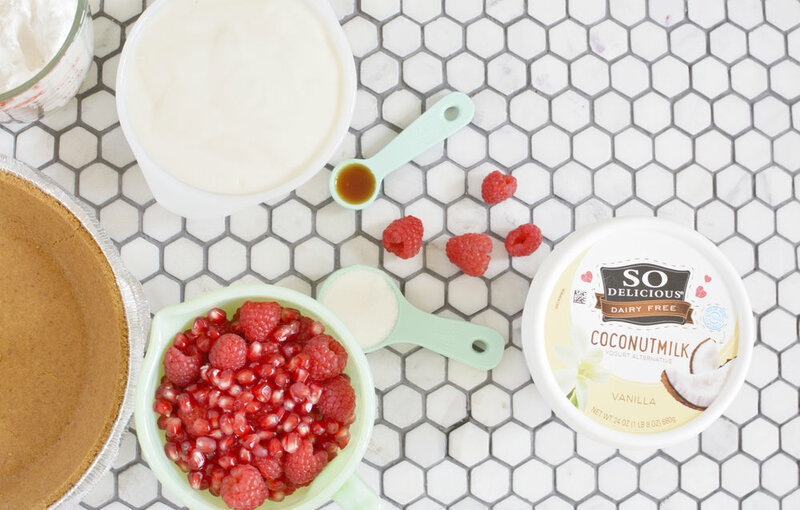 You can add the New So Delicious® Oatmilk Frozen Dessert + the New So Delicious Dairy-free Mousse to your Sprouts mobile app during the Checkout Challenge. Melt 1 cup sunflower seed butter for 30 seconds in microwave. Pour sunflower seed butter + agave nectar into the granola. Stir in the hemp seeds, chia seeds + vanilla. Preheat over to 350 degrees. Lightly grease a 9 inch spring form pan. Pour + press the combined granola mixture into the pan. Bake at 350 for 10 minutes. Let cool. While preparing the granola mixture, let the So Delicious® frozen desserts thaw. 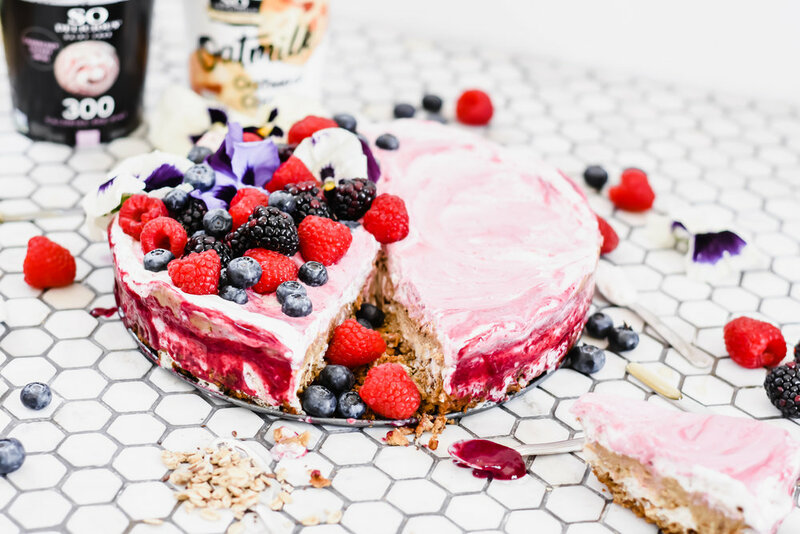 Pour the So Delicious® Oatmilk Oatmeal Cookie Frozen Dessert onto the granola crust. Melt 1 cup of sunflower seed butter for 30 seconds. Pour over the Oatmilk Oatmeal Cookie Frozen Dessert. 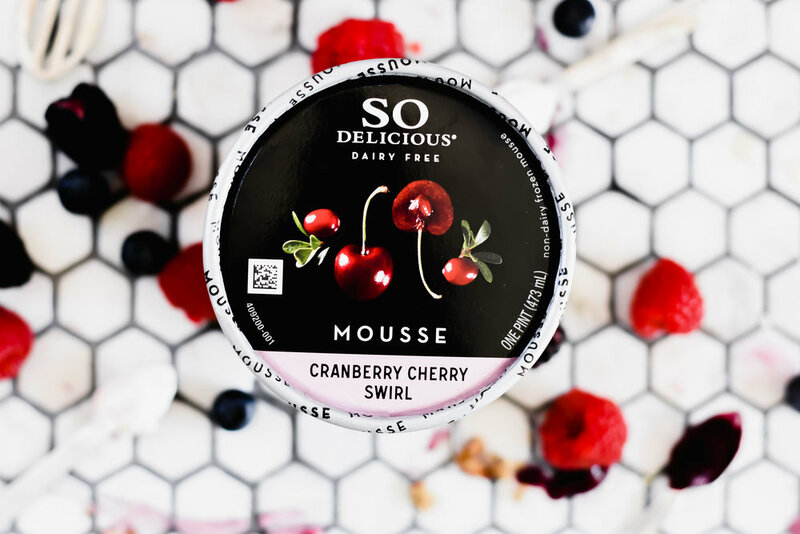 Pour 1 1/2 Containers So Delicious® Cranberry Cherry Swirl Dairy-free Mouse over the sunflower seed butter layer. Place in the freezer for two hours or overnight. In a blender, blend together 2 Cups Frozen Cherries + 2 Tbsp Agave Nectar. Swirl this mixture onto the top of the pie. Arrange fresh berries + edible flowers on the top of the pie. Reserve additional berries to serve alongside the pie. Plant-based diets can center on progress over perfection. Desserts can still be enjoyed while created from plants, yet completely decadent. Enjoy your bowl full of plants that is disguised as a pie! 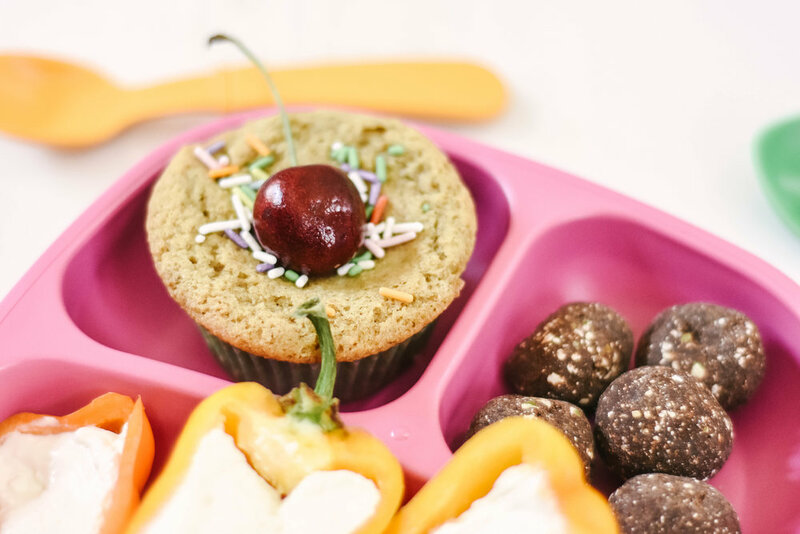 This recipe was created in partnership with Silk + Sprouts. I only share products + brands that I honestly love + use. And, you can find me at Sprouts often with a cart full of plant-based products + plant-based beverages. I have partnered with Silk + Sprouts to help promote Silk Almondmilk + the Sprout’s Plant-Based Tasted Great 35% off sale running 3/27/19-4/3/19. Looking for inspiration to fill your spring mornings with color, taste + plants in one easy bowl or cup? Small steps leading to change can absolutely add up. Change can happen one morning at a time, one smoothie at a time, one plant-based alternative at a time. Create a smoothie you love with this DIY guide here with So Delicious. Sprouts Farmer’s Market is holding a “Plant Based Tastes Great” 35% off sale running 3/27/19 to 4/3/19. 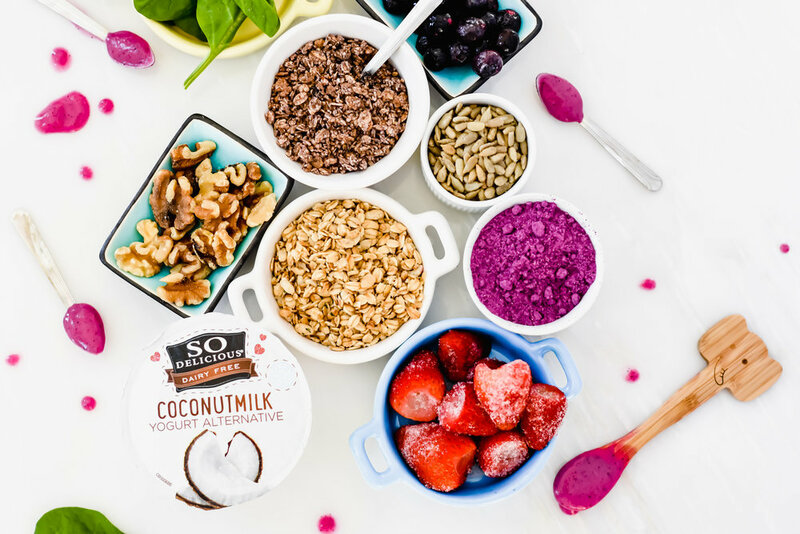 This is the perfect time to stock up on plant-based yogurt alternatives + milk alternatives to help achieve your plant-based goals one step at a time. 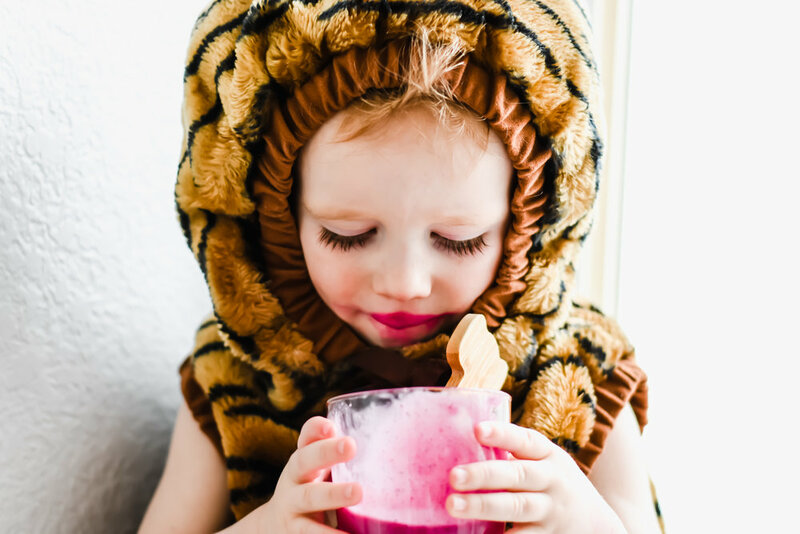 Here are some great products to have on hand to create a single serve smoothie you can enjoy any time of the day: So Delicious 5.3OZ Yogurts: Vanilla Coconut, Strawberry Banana, Blueberry + Raspberry. The So Delicious 24OZ Vanilla Cultured Yogurt Alternative is also an excellent staple to create family-sized smoothies. Blend together on Medium, top with sprinkles + a fun straw + enjoy! However you choose to create your smoothie, just remember every step counts. Start with a combination you know you will love + venture out to adding a few leave of spinach, then next time maybe a few more. Remember, progress is perfection. This recipe was created in partnership with So Delicious + Sprouts. I only share products + brands that I honestly love + use. And, you can find me at Sprouts often with a cart full of plant-based products + plant-based beverages. I have partnered with Silk + Sprouts to help promote Silk Almondmilk + the Sprout’s Plant-Based Tasted Great 35% off sale running 3/27/19-4/3/19. I’m a Midwest girl living in a Colorado world. Wherever I am in the world, part of my heart is in the Midwest. Particularly, in a cornfield in Southeast Michigan. I’m sharing why the Midwest is Best with Mazda. The Midwest is calling + you should go. Here are 9 reasons why you should book your next trip to the Good ‘Ole Midwest. The Small Towns are Charming. The small towns scattered throughout? They are quaint. They hold some history. They are a blast to explore. There is always something to explore in each small town you drive through. The towns take pride in their own little corner of the Midwest + they’ll show you their hospitality when you stop by. I love the town, Tecumseh, Michigan, where I’m visiting here with Mazda. Not only are the lakes beautiful, but there are lots of lakes to explore. To find a lake surrounded by the tall trees is like a piece of Heaven waiting for you to relax, unplug + connect with the people you love out on a lake, floating, swimming, boating, canoeing or kayaking. The kids playing in the shallow water, making sand castles + rivers. That’s what childhoods are made of. The People are Warm + Friendly. There really is something to the Midwest Hospitality, wouldn’t you say? Need directions, a cup of coffee, help shoveling your driveway? Don’t be shy, Midwest Values seem to prevail. The pace of life can feel slower in the Good ‘Ole Midwest, so sit back + enjoy some time at a bon fire with people you love. The Grand Traverse Area is One of the Best Places in the World. You can visit yourself to decide, but Northern Michigan is truly a special place on this planet. Each season has something to offer in the Grand Traverse Area. Summer: swimming + boating in the beautiful aqua lakes, the Cherry Festival + hiking + biking the many trails. Fall: The colors are on fire + there’s nothing quite like it. Winter: snowmobiling, snowshoeing + visiting the ice covered water is just the tranquility we need. Spring: the perfect time to hike the Great Sleeping Bear Sand Dunes + drive the scenic M22 route. Take an opportunity to just sit + watch fireflies float about as the sun is setting, is a beautiful experience, no extra events or effort required. Just a chance to connect with nature + experience the fireflies + soak up the Midwest lifestyle. 6. The Forests are Healing. Science shows us that forests are healing. Even just a few minutes spent in a wooded area is proven to lower cortisol + stress levels. There are so many forests + trails to explore in the Midwest. There are beautiful forests in Northern Michigan, especially when they are covered in a blanket of white in the winter. 7. The Great Lakes are Great. Who needs a trip to an ocean when you have the Great Lakes? Fresh water + fresh fun. The beaches + parks + playgrounds along the Great Lakes are easily accessible, reasonably priced + fun for the entire family. 8. The Orchards + Small Farms are a must. The Midwest is home to many orchards + small farms. Traverse City is the Cherry Capital of the world. The fresh cherries are amazing + there are many wineries to explore as well. And, come fall, you can find many quaint pumpkin patches + apple orchards throughout the Midwest. Let go of everything and explore a pumpkin patch, an apple orchard + enjoy the time right where you are at. 9. Your Family is There. Hey, even if you don’t have family in the Midwest, you might make some friends that turn into family. The fall colors in the Midwest are fabulous. 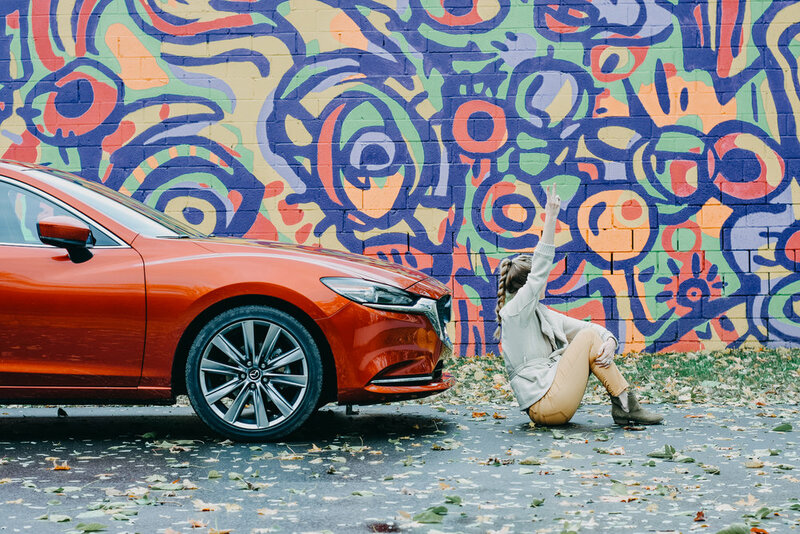 Take a drive with Mazda, explore the fall colors. See the historic downtowns. Enjoy the fresh farm stands. Looking for a perfect family vacation idea? I've got you covered. Views. Therapeutic water. Sun. Shade. Kid friendly pools. Waterslides. HOT pools for the parents. A nearby park. Ummmmm, Rocky Mountain Heaven. They don't call Ouray the Switzerland of America for nothing. All the heart eyes for this San Juan Mountain Range. 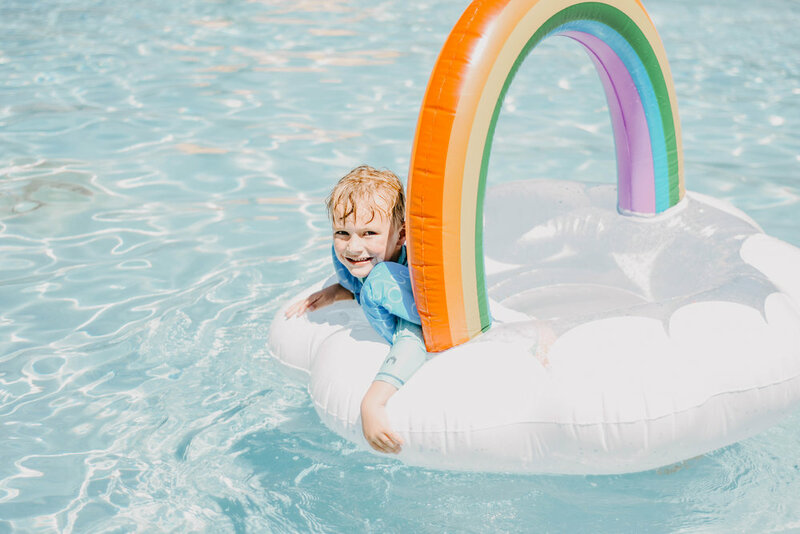 Our family absolutely loves Ouray Hot Springs + I think you will too. The newly remodeled pool has something for everyone. A volleyball area, an obstacle course for older kids, a water slide, a shaded pool, HOT pools, lap lanes. Tons of chairs + even shaded areas for seating. This overhead photo was taken during our family hike on the Perimeter Trail. I absolutely recommend this trail for families. There are some steep sections + the kids likely won't hike the entire loop, but it's an excellent experience to hike as much as you can together. This pool offers awesome floats to rent or, you can bring your own. Bowan was in love with this life-like gator. He was a wild one to ride! Where else can you do a waterslide with this kind of view? Breck loved the waterslide. He had such a great time! Breck snorkeled the day away + had the absolute best time. He's really gained confidence as a swimmer this summer + snorkeling in the warm water really gave him a great opportunity to improve his swimming skills + confidence in the water. Bowan was living his best life on the float we found at Target. Bridger was worn out after a lot of fun in the sun. 1: Drive the Million Dollar Highway. 2: Explore the old mining towns along the Million Dollar Highway. 5: Play at the park downtown Ridgway. 6. Eat at Eatery 66 in Ridgway, CO. Vegan, gluten free + allergy friendly options. 7. Explore Box Canyon Falls in Ouray. 9. Take your 4x4 off roading on the high alpine trails. 10. Play at the park in Ouray right outside of the hot springs. This post was sponsored by Ouray Hot Springs. This is one of our favorite spots in America + we think you will love it too. Taking a trip "Up North" is a chance to go somewhere magical with sun, sand, snow, hills, dunes + great fresh water lakes. It's a chance to connect with nature, find yourself a little + create special memories with your family. I'm sharing 5 family friendly hikes in Traverse City + why the Toyota Highlander is an awesome family car. 1: Sleeping Bear Sand Dunes: The Sleeping Bear Dunes National Lakeshore is the most popular single attraction in the Traverse City area. And, for good reason, it is beautiful + the end result of the hike brings a stunning view of Lake Michigan atop the dunes. The Dune Climb is totally worth it. A childhood memory of mine + my kids absolutely loved summiting the dunes + seeing the water on the other side, they thought it was the "coolest thing ever." There is a 27 mile long trail that runs along the dunes, so you can plan out multiple adventures here. 2. The TART Trail: The Traverse Area Recreation and Transportation Trail can take you on an adventure east to west across the city. If you're up for it you can cruise down the entire 10.5 mile trail, or take it in stride as long as your family would like to go. Another bonus, is the trail is paved so the kids my like biking, or in-line skating along the trail. You can even stop for lunch or a snack at a restaurant along the trail. 3. Empire Bluff Trail: This 1.5 mi loop is definitely doable with kids. It has amazing views of Lake Michigan, an opportunity to hike through a peaceful Michigan forrest + views of open fields, too. The town of Empire is very quaint + a fun spot to stop. 4. Leelanau State Park Trail The Leelanau Peninsula is another breathtaking area. You take the M22 scenic drive to arrive to the park + that in itself is an adventure. You can take the well marked hiking trails to see the lighthouse or Fox Island. If you make it up to this hike, absolutely stop at Fishtown Leland to explore the historic fishtown. 5. Old Mission Point Park Trail: A trip to Northern Michigan isn't complete without a trip to a lighthouse. The drive to the lighthouse is beautiful along the peninsula + a stop at the Jolly Pumpkin on the way is another must. This 5 mile loop can help you feel like you a floating back in time with the lighthouse + help you to connect with nature in the trees. There is so much adventure to be found in Northern Michigan, explore + go where your sails take you! 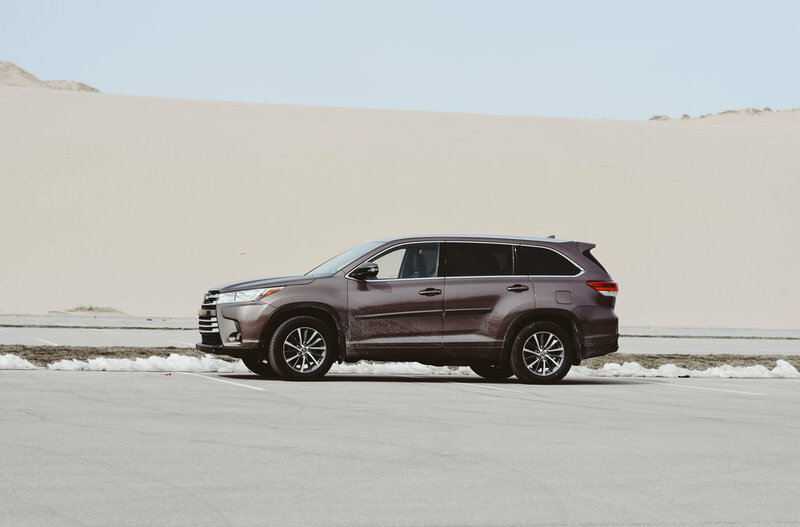 We traveled around the Traverse City area in a Toyota Highlander + my husband + I both agree it is an ultimate family car. The safety features are incredible from listing the street name + speed limit on the dash to the added steering control. My husband loves the excellent horse power. I loved the compartment to store tons of snacks between the two front seats. The bucket seats make it so easy for the kids to get in + out + the all wheel drive makes any hiking adventure much more fun. I always try to take as much caution as I can on a road trip with my most precious cargo inside, but of course I can get a little off track at times. The Lane Departure Alert with Steering Assist was the most helpful feature I've ever experiences on a car. If I got a little right or left of the lane, the car auto-corrected. It was amazing. The entire Toyota Safety Sense package was amazing, but that was my favorite part. If you are planning a family vacation, I highly recommend a trip to Traverse City, Michigan. The water is blue, the air is fresh + the trees are calming. Have you been to Traverse City? Let me know in the comments. Looking for comfortable shoes for you? I have the brand for you: The Walking Company. Click here to discover your new favorite shoes. Looking for adorable + comfortable shoes for your kids? Click here to discover the PediPed brand. I highly recommend them! This post was sponsored by Toyota + Traverse City Tourism. I only share things that I absolutely love + believe in + I hope this post was helpful for vacation planning + future car shopping. Cheers. 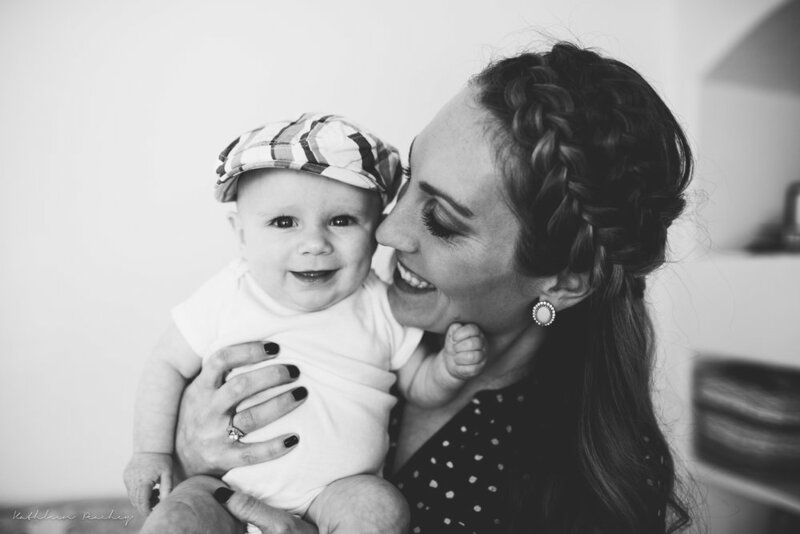 I'm going to get a little personal here about working from home as a mom, running my own businesses + life as a boy mom, all while trying to stay sane. Ok, trying to stay slightly sane, since I'm being honest. I've worked from home in some capacity for the past 6 1/2 years, since becoming a mom to Breck, my first born. But, #momboss mode has taken on a completely different level for me since acquiring American Gluten Free. We live in such an amazing time where opportunities can be abundant because of technology. It's incredible! However, just because opportunities are available, it doesn't mean balance automatically comes with it. Just like anything in life, balance has to be sought after, protected, practiced. The more we bring into our lives, the more we have to work to balance out, schedule out, take out, or delegate. Or, set aside until we can get back to it once things settle. All of this takes time + time is so precious, especially when you have three beautiful boys growing up right before your eyes. What balance looks like + feels like for me probably doesn't look the same or feel the same for the other #mombosses. All of our situations are probably quite different. I shared here why I purchased American Gluten Free + why I felt like becoming The CEO of American Gluten Free was the right step for me. Let's get really real here. Nothing in life is perfect. It's just not. There's a give + take. Sometimes the give is more than the take. And, sometimes we have to give a little less to feel life a little more. Is this new business opportunity going to change my life? It already has. Is it going to change me? It already has. Will it continue to grow + stretch my family? It already has. I'm not sure where this all will take us, but hopefully somewhere good. Something I'm willing to get really personal about here is the internal struggle that comes with acquiring or starting a new business. This is true to me, but it seems to be true to many that go down this road as well. I mean, we are putting ourselves out in the world in a vulnerable way, so it's no surprise that internal struggles creep in. Self doubt. Any negative self-talk that swirls in my head on a daily basis, has come out like a ravaged beast. It's like an internal battle raging war on myself day in + day out. (Research tells us that we all have repetitive negative talk going through our minds on a daily basis + the same negative thoughts are on repeat for all of us. Our voices are just different). Something I've really been focusing on to get to the root cause of my negative self-talk. This has honestly been good (though hard) for me to face, as I set out to really rebuild my life + myself after my recent miscarriage + D&C + my son, Bowan's two recent anaphylactic episodes that were both life threatening + traumatic. After facing such painful experiences back to back, I realized my life just wasn't set up to withstand such difficulty. That led me to find a way to better structure my life + a lot of it centers on cultivating deeper personal strength. Running a business really helps to work you down to your core + it helps bring you more to the person you're meant to be. Priorities. Let's face it, we have to prioritize. Not just our time, but who we want to be. I want to work, yet I want to be with my kids + that's something I've had to work hard to figure out. Prioritizing things within the business are really important too. What is absolutely most important now, what will we get to next? What has to wait, what do we need to explore to see if there is a better or different way? Another priority of mine is to pay off our medical bills, on average we get about 3 medical bills in the mail each day. They just keep coming + we haven't even had any recent medical appointments. So, when I think about giving up, this priority of paying off our medical bills is set for me, something I'm working toward. Passion. It's so important to have some kind of passion project in life. Maybe it's a corporate job, or side hustle, or artwork on the weekend, or personal photography of your kids, or activism in the community. Running a small business surely needs to center around passion. Is the mission of the company central to a core passion of yours in life? I am so passionate about health, finding safe foods for people with food allergies, Celiac + autoimmune diseases. These things have touched my life in such a profound way, I can never go back. I can never un-be who I am because of these things that have changed me. Because I care so much about the central mission of American Gluten Free, it keeps me coming back even after the long days + long nights. 1. Write down your why in life. Write down your why in business. How do they cross? How can they compliment each other? 2. Write down your top 10 priorities in life. How can you make sure to include them in your daily + monthly life? If some things have to fall by the wayside for a short time, how will you get them back in? 3. What negative self-talk to you tell yourself? Name it. Work through it. Give that voice a name. Tell her you hear her, but keep moving on + don't give in to her. 4. What 10 things are you most passionate about in life? How can you work them into your personal life? How can you work them into your business? 5. Remember, how things look on the outside doesn't mean they feel the same way on the inside. How are you going to make things feel right on the inside once you peel back the layers of the business? 6. How do you want your customers + clients to feel? 7. Is there anything you can delegate? Make a list. 8. Make lists. Find a beautiful journal + make a list of all of your ideas in one place. Business ideas, ideas for your personal life. All the ideas. Come back to them + explore them often. 9. Find a way to get movement into your day. A focused run or yoga class is ideal. But, since #mombossing it ain't easy, sometimes we've got to get creative. Take the kids on a run, do some yoga with the kids. I love to lie on a yoga block in fish pose. Do some plie's while washing dishes. Find a few ways to move during the day, your thoughts + emotions will thank you for sure. 10. Make a list of the things you are doing well. It's so easy to feel discouraged even when things are going well, because the to-do list might be longer than the day's accomplishments. Make a list of the things you are doing well + the things you've accomplished recently. This post was sponsored by Gigi New York. Because sometimes #mombosses just need a beautiful purse to help express their creativity + to help them feel confident in the day to day of running a business. I only share things I love + use + I'm happy to share this brand with you. If you are looking for adorable + comfortable shoes, I have the brand for you: The Walking Company. Click here to discover your new favorite pair of shoes. Corn on the cob is a fresh summer staple. Here's a fun way to spice it up with fresh dill. Still with a buttery, rich flavor. Yet, dairy-free + full of goodness. Traditional corn on the cob includes loads of butter. But, this recipe is totally dairy free. So, if you're Vegan, DF + GF, have a dairy allergy, or are focusing on plant-based meals, this recipe is for you. Fresh dill on corn? Yes, totally a match made in Heaven. Try it. Love it. Make it again on a hot summer evening. Spread on your prepared corn. Heck, try in on some roasted potatoes, too. I carry a lot, you carry a lot, we all carry a lot as moms. I mean, we fill our diaper bags + backpacks to the brim. But, we also carry responsibility, emotions, memories + dreams. I recently discovered the Vilah Bloom line, I'm in love with this bag + I'll share with you about it here plus the things I carry. I was born + raised in Michigan. And, Northern Michigan will always have my heart. You know what I mean, if you've ever been Up North. Vilah Bloom is a company that is based Up North in Petoskey, Michigan. All the more for me to love. I recently took a trip to Traverse City, Michigan + Petoskey is nearby, on the beautiful Lake Michigan. As a mom, I carry wipes. And, I make sure to throw an extra container of wipes in my bag on the way out the door, just incase. So, I'm probably carrying around 3 packages of wipes on any given day. I mean, mom life for sure. I love that the wipes are so easily to grab right in the center of this bag. It lightens my load a little for sure. I carry so much, my hands are normally full + my mind a checklist. Having a backpack helps as I try to be mindful + let things go while I experience the present moment. So, in my bag, I pack a journal, a good book + a nice pen. I try to unpack my feelings, dreams, to-do list, goals + thoughts. I may only have a short time to write or read until I'm interrupted, but at least I'm tending to myself even in a small way, when I can fit it in. I absolutely love this bag + I know you will too. It's an expression of my style, completely useful + a place for me to pack all of my things, especially those wipes. There once was a time when I had to throw away or give away almost everything I had in my pantry + fridge + start completely over. The food I had in my house, that was meant to nourish my family could really harm my son, Bowan. Honestly, some of the food, like the peanut butter or the jar of tahini could be fatal, even. After Bowan was diagnosed with life threatening food allergies, life changed forever. My pantry was already "clean" but, main ingredients that should be safe, had "may contain" warnings, the jars of jelly were cross contaminated by our own use, you name it. I have lived the struggle to find safe food to eat. I realize many others feel the same, that is why I purchased American Gluten Free. I've been surrounded by food that I couldn't eat. I've cried in the grocery store. There was a point when I couldn't walk down certain aisles in the grocery store, because I may have been able to find just one safe thing there + it was just too sad + overwhelming for me to sort through the labels. With mustard, soy, wheat, garlic, sesame allergies + more, the salad dressing aisle was a difficult place to navigate. The nut butter aisle just made me sad, because as a vegetarian, I of course had loved tree nuts my entire life + then I went to cutting them out completely because I continued to nurse my allergic son. So, I lived as if I could not have trace amounts of allergens, just as Bowan needed to avoid his allergens. I realize everyone is coming to American Gluten Free for different reasons. We might all need food that is "free from" for different reasons, yet still share the same need. Maybe it's Celiac, IgE mediated food allergies, autoimmune diseases or other medical reasons, but the need is there. Wheat is abundant in America, + the amazing gluten free products are abundant as well, but sometimes difficult to discover. So, I am here to get those to you. I've shared how this opportunity to purchase AGF came up here. It wasn't something I even had on my radar, but the opportunity opened up + here I am. I hope you love receiving this happy mail one a month. I will work hard to bring you excellent products that you may have yet to discover! 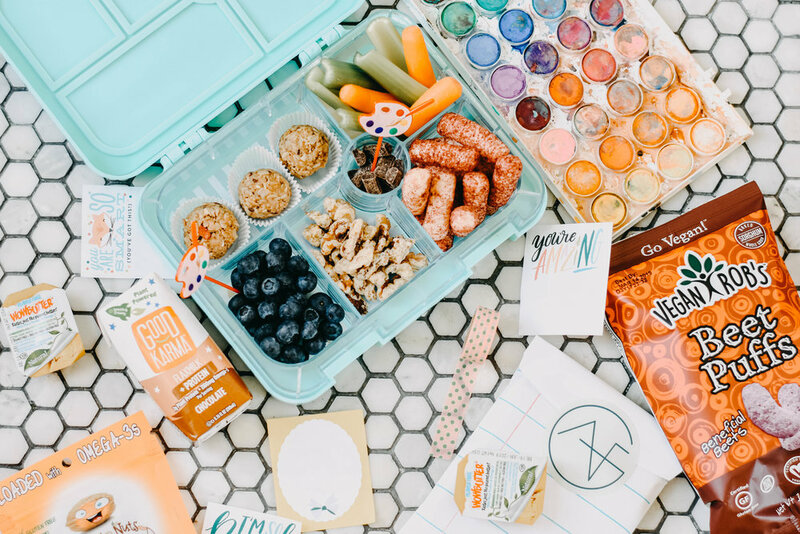 My years of allergy mom label reading + research will be put to good use to help others discover new foods you will love. I went from never running a subscription box company to picking up where the founder, Erika left off, fulfilling the products + learning to ship and complete the orders all in less than thirty days. There still is much on my to-do list + I'm doing my best to keep the quality as expected for the current subscribers, even with the traffic duty I had to do all month at Breck's school. Life sure can be overwhelming at times! My son, Bowan recently outgrew several allergies. Skin testing + blood work at Children's Hospital Colorado revealed low + negative numbers to multiple foods that Bowan once clearly tested positive to + had previous reactions to. Over the past 6 months we've had many appointments at Children's Hospital Colorado to complete supervised Oral Food Challenges. It felt like true miracles when he passed multiple challenges to: peanut, tree nuts, soy, shellfish + pineapple. Talk about our life opening up again + some huge burdens lifting from my shoulders. Bowan has had two very serious life threatening reactions to kiwi + peach in the past six months that were unknown allergies. None the less, I thought how did I go from living with such restrictions to being almost let off the hook from food allergies? My heart just breaks for other families going through what we face daily. So, here I am finding my way to give back to the food allergy + Celiac community that has so graciously given to me. Here I am, an allergy mom turned food photographer + blogger + recipe developer, turned entrepreneur. Life sure has given me some lemons. Some of them pretty sour + I'm doing the best I can to turn them to lemonade. For now, this business is entirely running out of my home. My two older sons may have helped fold or pack your boxes. My oldest son, Breck calls himself the Head Assistant + he insists on "trying out every job." My mom may have carried your box up the stairs, my husband may have taped your box, my friend Stephanie may have helped pack yours + I absolutely stayed up late finishing each box up. 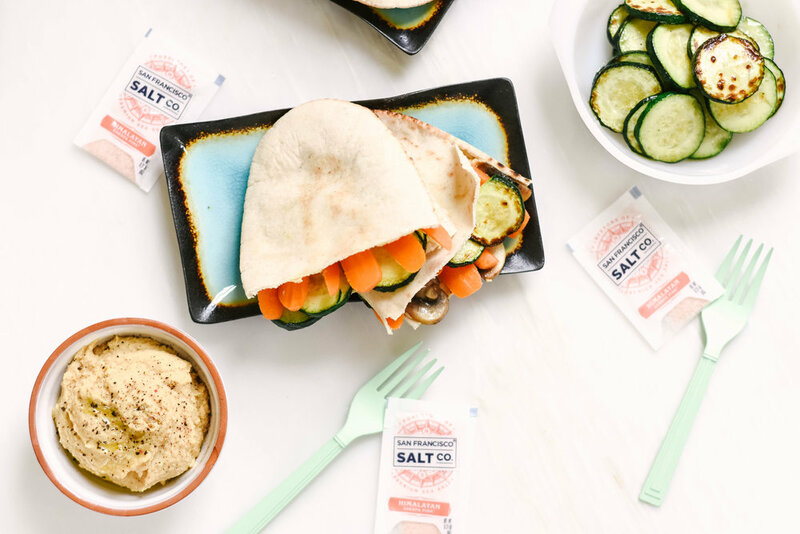 And, another gluten free entrepreneur across the country is doing a happy dance because you got to try their new product that they so tirelessly worked to create. I'd love to know why you are here. Please comment below if you have Celiac Disease, food allergies, an autoimmune disease or any other reason that leads you to a gluten free + dairy free lifestyle. I also created a survey that I would love for you to take so I can serve you to the best of my ability. Please take this quick survey here. Thank you so much for stopping by to learn why I purchased American Gluten Free. Please stop by + say Hi! And, I hope to have a package heading to your mailbox soon. Use code 10DOLLARSOFF for $10 off your current or future subscription. Photos are a treasure. Honestly, my digital photos are often buried treasure. My photos can easily get lost in my unorganized digital world. I like to take a lot of photos of my kids, so we are talking serious buried treasure. Here, I'm sharing 5 reasons why you should be printing your digital photos with Parabo Press. Memories both big + small are such a gift. I often look back + it's the small, silly memories of my kids that I love to see most in pictures. Printing our photos helps us seal those memories so we can travel back to them. I love using Parabo Press because the quality is excellent, you can print from your phone or computer + You can even have framed photos like these delivered right to your door step. 1. To get organized in your digital space. We take a lot of photos! The more we take, the further we can get behind on organizing, printing + storing them. To help me stay organized, I connect my phone to my computer + upload some of my photos. This also helps me free up space on my phone- because I fill it up really quickly. I upload my photos to the Parabo Press website + I print squares that I hang + I also store in my kids individual photo boxes. I also print books for each of my kids, because books feel so organized! Plus, my kids truly looking through books that are completely their own with their memories in them. After I upload my photos to print, I organize my photos into files on my External Hard Drive. I organize by month, events like holidays, some photos go in individualized files per child + some photos get saved under favorite photos. Because, you want the special files in an easy place to find when you might be looking for them. 2. It's great to have printed photos on hand. I've had multiple times when Breck has needed photos for a project for school + the turn-around time for the project is quick. I try to not rush around like a chaotic woman, so the last thing I want to do is run to the drug store in a mad dash for photos. 3. The square prints are really fun to use as cards. The photos are printed on very thick paper, so they feel like card quality. You can write a personalized note on the back + mail it off! A super easy way to create personalized cards. 4. It feels great to have a large family photo in the house. Sometimes a really special moment is captured that transcends other moments for us. Those moments deserve a special place in the house. Plus, if you get all the kids or the whole family in one photo, that is absolutely a treasured moment that needs to be printed. 5. Things can get lost. Digital files can get lost or corrupted. We may forget to back up files. Or, we may simply forget about the precious moments sitting in the digital space. Printing the photos gives us a "second copy" of the file or event. Plus, there really is something special about holding a printed photo + not looking through a screen. Keep reading for excellent coupon codes so you can get printing! I'm great at printing or making a card with someone in mind, but writing it + mailing it off is where I struggle. I really need to keep more stamps on hand + keep working on this! Another thing that I love about Parabo Press is that if you create + order a photo book, it is only $5 to print additional copies! I love this for my 3 kids, because I can create a book that includes all of them + print one for each of them: Breck, Bowan + Bridger. So, one day when they are all grown up, taller than me + move out of the house, they can each have their own books of memories. This is also a great way to print multiple books for grandparents! The engineer prints are a great statement piece to have. They are also printed so clearly even at the large size. I love that framed prints can be shipped right to our doorsteps. Goodbye empty frames on the wall. Free Set of 25 Square Photos. Just chip in for shipping. This post was created in partnership with Parabo Press. I honestly do print my photos here, I even ordered my Christmas Cards through Parabo Press. I love the quality + I really do have Parabo Press hanging up on the walls in my house. Thank you for supporting brands that bring you posts like this. Love the photography in the photos in this post? You can book Kathleen Peachey worldwide. Just mention Lindsey10 for 10% off any package when booking.